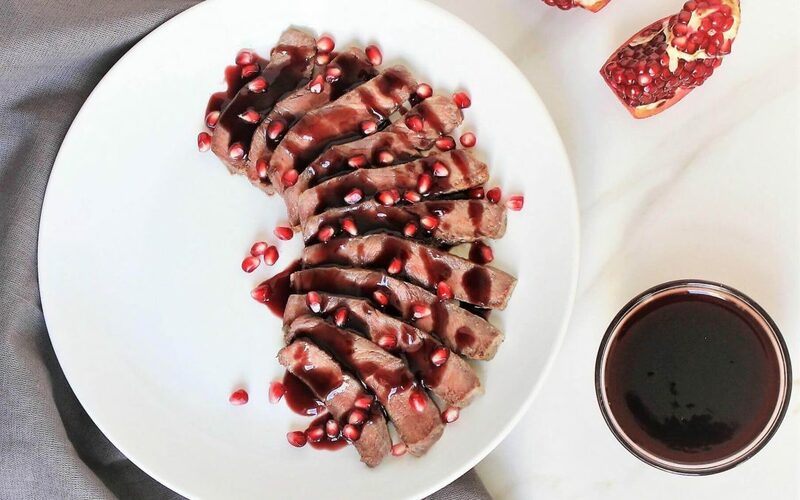 London Broil with Pomegranate Glaze - perfect for your holiday table! For years, yes years, I have attempted to make the perfect london broil and my results were always inconsistent. Most of the time I would end up with a tough and gamey meat. I didn’t understand how people got their london broil to be so juicy. Until I asked “Professor Google” and came upon bonapetite.com where a chef explains exactly how to get the juiciest piece of meat. I followed his directions, with the exception of reducing cooking time because I had a thinner cut of meat, and viola! It suddenly became so simple! But you have to follow every step of the directions for best results. Seriously, don’t get impatient. 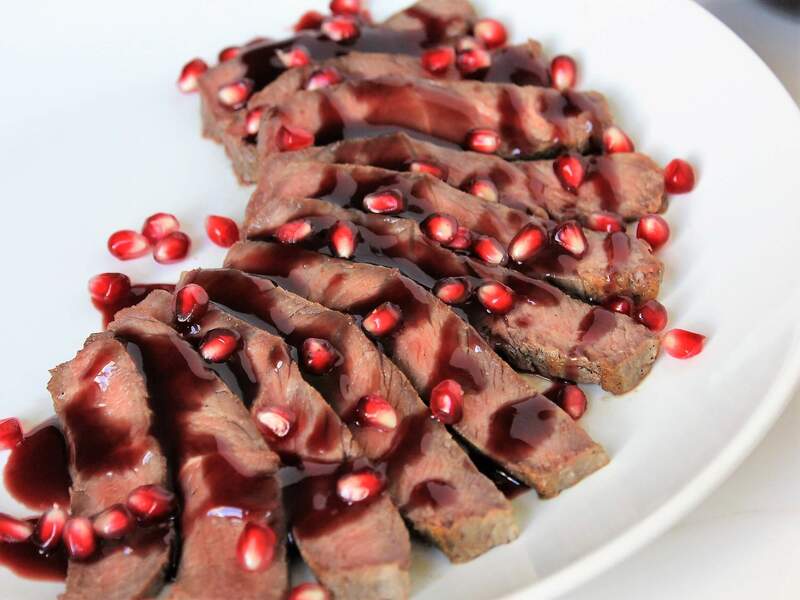 Add some pomegranate glaze and you’ve got a dynamite dish bursting with flavor. Meat is often demonized but it is actually a nutrient dense food source. When I eat meat I now I’m getting lots of iron, vitamin B12, phosphorus, zinc, and selenium – all important essential minerals and vitamins the body needs to function at it’s best. It is also an excellent source of complete proteins. The current recommendation for red meat intake from the American Institute for Cancer Research is up to 18 ounces per week. That is, at most, six 3 ounce servings. So as with everything, meat can be enjoyed and benefit the body in the appropriate amounts. London broil is the perfect meat to have because it is a lean cut (less fat) and super simple to make. Add this pretty dish to your holiday table, it is sure to be a hit! Sprinkle salt and pepper evenly on both sides of the london broil. Allow it to sit at room temperature for 1 hour. Do not skip this step, as this will tenderize the meat for a juicy bite. Heat a pan over high heat. Coat the pan with the oil and place the london broil in the middle of the pan. Allow it to cook for exactly 4 minutes. Flip and cook additional 3 minutes, 4 minutes if it is a bit thicker than 1 inch. This will result in a medium to medium/rare london broil, depending on how thick your cut is. I’ve tried both 1-inch and 1.5-inch thick cut. Remove the meat from the pan and allow it to cool 20 minutes – this will allow the juices to settle and result in the juciest bite. Meanwhile, prepare the glaze: place POM juice in a small saucepan and bring to a boil then reduce to a simmer. Continue to simmer until POM juice reduces by half the amount (about 20 minutes). This will concentrate the flavor. Add the balsamic vinegar and stir. In a separate small bowl, whisk together the cornstarch and cold water until well blended. Do not place cornstarch directly into the hot pan because this will result in clumps. Make sure to mix with cold water first. Add cornstarch mixture into pomegranate mixture. Bring to boil and stir until it thickens (it will coat the spoon). Remove from the flame and allow it to cool. Slice the london broil against the grain into 1/2-inch slices. 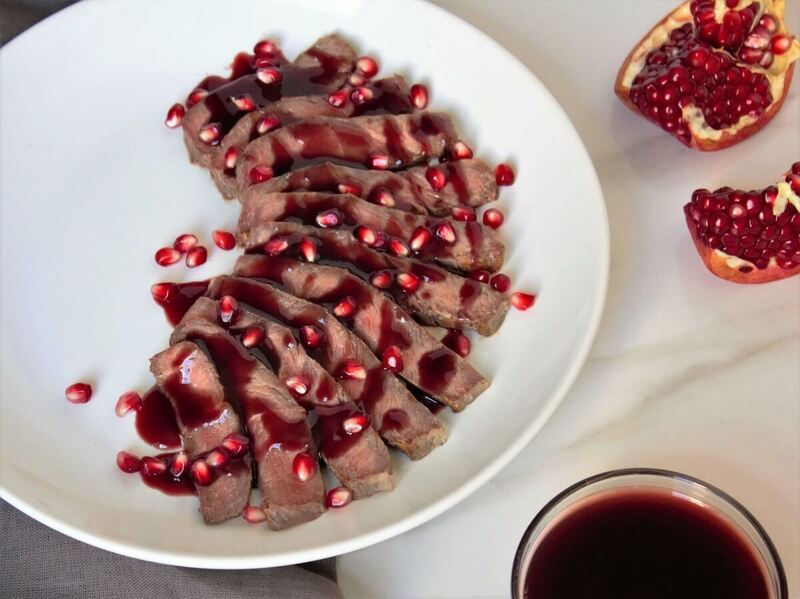 Layer the pieces in a serving dish and drizzle the glaze and pomegranate seeds over the meat slices. Enjoy! 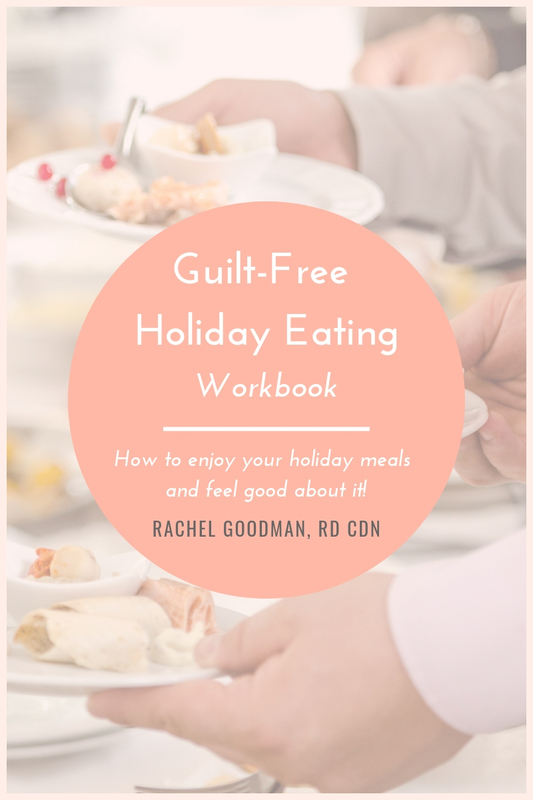 Do You Experience Holiday Food Guilt? Learn to trust yourself with food & eat in a way that feels good to you – without the stress! Say goodbye to guilt and make holiday eating joyful again. I want to eat guilt-free!